There’s been extensive discussion about the migrant caravan that embarked from San Pedro Sula in Honduras in October. By now, however, we know that this caravan is impossible to categorize as a homogeneous entity, as its members have made, and are still making, their way to Tijuana via different means of transportation and according to varying timelines, not to mention the many-faceted desires they hold. And there is at present the more disquieting reality that, after facing repression near the San Ysidro port of entry, thousands of caravan members are sheltered in makeshift encampments on the peripheries of Tijuana. At the grounds of a bus station on the edge of town, thousands of members of the migrant caravan had set up camp. Pueblos Sin Fronteras organizers opened the nightly assembly of the caravan and passed the mic on to local organizations, like Radio Totopo, that had come in solidarity. After two weeks walking through small towns in Chiapas and Oaxaca, the caravan had arrived in the Zapotec city of 90,000 people, a bastion of indigenous organizing in Southern Mexico. Like many moments in the caravan, no single organization was running the show. Juchitan city officials provided food and water, churches handed out donations, and the transnational collective Pueblos Sin Fronteras strategized to get buses to move north. At the heart of it all were the thousands of people who have banded together to move through Mexico. For 90 minutes, the members of the caravan paid close attention to the decisions facing them in the coming days and to the words of local and national organizations that had come to support them. Members of the caravan took the stage to explain why they nominated themselves to represent the group in negotiations with Mexican authorities. Trans women in the caravan took the mic to demand respect from the rest of the group. Radio Totopo is part of the resistance movement to Spanish-owned wind farms in the Juchitan area. Other speakers included the militant teachers’ union of Oaxaca, called the 22nd Section, and a group of Catholic nuns. The assembly created a space for the interests of working class, indigenous and migrant organizations to come together. The following morning, the self-designated security team met under a tent and assigned tasks for the day. While Juchitan municipal police were on hand, members of the caravan took a key role in making sure everyone was safe and respected the borrowed space. A Honduran man named Walter headed up the security team and designated tasks like monitoring the water stations and keeping order in the food lines. Juchitan was the rare exception where the caravan had a stage to use for the nightly assembly. Usually people crowd around in a circle and shout over the chatter to make their voices heard. That was the case a week later in Mexico City, when the group had to decide how to continue north. The exodus of Central American migrants and asylum seekers began arriving on Sunday, November 4 to a sports stadium in Mexico City’s eastern sprawl. Doctors provided check-ins, US-based organizations offered legal advice, and a kitchen churned out thousands of meals three times a day. On Tuesday, November 6, the day of midterm voting in the US, the caravan members had much more urgent concerns than the electoral results. For three weeks they had been walking and hitching rides from San Pedro Sula to the Mexican capital. As thousands of people milled about, Bartolo Fuentes arrived to give a press conference. Fuentes is a Honduran organizer and journalist who has worked with Honduran migrants for decades. In his radio show “Sin Fronteras,” on the community station Radio Progreso, he shares Honduran migrants’ stories. He has also organized groups of Central American mothers searching for their disappeared children in Mexico, a tradition now in its 14th year. While the migrant caravan organized spontaneously this October, it now relies on the groundwork laid by organizers in Mexico, Central America, and the US who have agitated for migrant justice for years. When Fuentes heard that Hondurans was organizing over Whatsapp and social media to leave in a larger group towards Mexico, he decided to help them based on his years of experience. By the time the group left San Pedro Sula on October 13, it numbered in the thousands. In Mexico City, Fuentes tried to set the story straight, explaining that the caravan is making visible a long-term phenomenon. “Caravans happen every day in Honduras,” he shouted into the mic, exasperated. “250 to 300 people leave Honduras every day.” In other words, the current exodus of Hondurans is part of a longer trend ongoing out-migration from Honduras: what is new are the forms in which such migration happens, like the more politically visible, mass character of the caravan itself. “This caravan is changing the way that people flee Honduras. That’s what’s relevant, not who organized it,” he continued. Fuentes has been accused by his own government of illegally organizing the migrant caravan. He is now waiting to return to Honduras, where he fears he could be detained. As the caravan arrived at the Mexico City stadium, another distinct thread of migrant activism, the World Social Forum on Migrations, was taking place nearby. The Forum included the first ever World Meeting of Mothers of Disappeared Migrants. Mothers and family members of disappeared migrants came together from countries including Guatemala, El Salvador, Honduras, Senegal, Morocco, Mauritania, and Tunisia. While presidential tweeting and international media coverage has brought newfound attention to the plight of Central American migrants, the movement in Mexico and beyond to support undocumented people in transit has been growing for years, through slow, steady organizing work in impacted communities. This work has only become more urgent in recent years, and both the US and Mexico have implemented harsher anti-immigrant policies that predominantly impact Central Americans. Hondurans, Guatemalans and Salvadorans have passed through Mexican territory to reach the US border for decades. Migration from Mexico to the US peaked before the Great Recession, and now more Mexicans return to their home country every year than enter the US. Meanwhile, the flow from the Northern Triangle of Central America has grown consistently since the 1990s. The number of immigrants from the Northern Triangle living in the US rose 25% from 2007 to 2015. As increasing numbers of Central Americans attempted to enter the US, the Bush and Obama administrations outsourced immigration enforcement to Mexico. Strict visa requirements that the vast majority of Central Americans cannot fulfill force them to enter Mexico undocumented. They must either navigate the route alone or pay a guide (coyote) thousands of dollars to secure shelter, transportation and, frequently, bribe government officials to pass through checkpoints. The freight train known as La Bestia for years defined the migrant route through Mexico. Óscar Martínez has written a vivid account of the dangers, uncertainties, even mutilations encountered on the migrant trail, but also the remarkable stories of refusal that underlie its existence. As a volunteer at a migrant shelter in Ixtepec, Oaxaca in 2013 and 2014, I observed how hundreds of people would board the train to move from town to town. Sometimes the train would come to an abrupt stop and people would fall, sustaining horrible injuries. However dangerous it was, the train provided a reliable option for Central Americans to move north. However, during 2014 the number of unaccompanied minors arriving on the US border shot up. Mexican President Enrique Peña Nieto responded to the increase by creating the Southern Border Plan. Three days later, the Senate Foreign Affairs Committee under the Obama administration committed $86 million to the Plan, which was followed by additional funding from the Merida Initiative. Wantonly putting migrants’ lives at risk, Mexican authorities began stationing more immigration agents along the train tracks and increasing the train’s speed to deter riders. Unable to reliably ride La Bestia, migrants were forced onto remote backroads and trails. In my subsequent visits to Ixtepec, few people were riding the train. Those who made it to the shelter had often walked for days, following remote trails to avoid immigration checkpoints. Many had been attacked by gang members and petty criminals wielding machete or guns. The migrants and asylum seekers had to surrender what little possessions and money they carried. Many arrived barefoot at the shelter; not even their shoes had been spared by the thieves. By design, the continuous flow of Central Americans through Mexican territory is largely invisible to most Mexicans. Small towns in states like Tabasco, Chiapas and Oaxaca witness the daily exodus, but there has been little pushback from Mexican citizens towards the state’s policies toward migrants. Outgoing president Peña Nieto has ceded to US pressure. Deportations from Mexico now exceed deportations from the US. In 2017, Mexico deported 94,500 people to Honduras, Guatemala and El Salvador. Meanwhile, incoming president Andrés Manuel López Obrador will be inaugurated on December 1. He has stated his support for migrants (historically, for Mexican immigrants in the US but more recently for Central Americans in Mexico) and is a strong critic of the Trump administration. Though Peña Nieto has been reticent to crack down on the caravan in past weeks, demonstrated by the rejected offer for temporary work visas and social benefits for migrants, his interior ministry has taken a harsher tone and deportation measures in response to the attempts to cross the Tijuana border. To evidence the grave dangers Central Americans face in Mexico, civil society organizations have staged caravans for years. Every year during Lent, religious organizations aiding migrants organize a “Viacrucis,” or Stations of the Cross, to bring attention to the situation. Many Catholics in Mexico recreate the Viacrucis each year, the most famous being in the Mexico City borough of Iztapalapa, where thousands of people gather to watch the procession. These original migrant Viacruces were contained in Southern Mexico, and the migrants who took part had no collective options to continue to the Northern border. Since 2014, these largely symbolic processions have taken on new meaning. That year, the train conductors in Tenosique, Tabasco refused to transport members of the Viacrucis, and the group of 450 people decided to walk to their next destination in Chiapas. As the Viacrucis advanced, it earned the support of Mexican civil society and local government. I wrote in 2014, “The participants no longer had to walk along the highway, hoping for donations of food and water from passers-by. They used their political capital to secure buses, meals and medical services from state and regional governments and local organizations.” Their numbers swelled to 1,000 and in Mexico City, the group secured “transit visas” which allowed them to travel safely to the US border, while others chose to stay and work in Mexico. The year 2014 also indicated a shift in the politics of migrant support networks in Mexico. Most shelters only attend to the immediate material needs of Central Americans, which are often dire, but do not afford opportunities for political education or organizing. The 2014 Viacrucis sparked conversations in shelters, collectives and non-profits around Mexico about the agency of Central Americans. Some who decided to live in Mexico began taking on organizing roles. To be sure, the existing for undocumented people in Mexico to organize are significant. Many are in transit through the country and for their own safety must closely protect their privacy. Those who decide to live in Mexico or enter a limbo stage because they cannot cross to the US, are treated as irregular and undocumented migrants are much the world over: subject to tremendous exploitation, paid minimum wage or less, and highly exposed to the authority of their employers. While Mexico has a strong tradition of accepting refugees from the Southern Cone of South America and during the Guatemalan Civil War, there has been little public recognition of the violence and persecution that many Central Americans face in their home countries. Discrimination and racism towards Central Americans is the norm in many parts of the country, as evidenced by violent protests against the caravan when it arrived in Tijuana. As the caravan members arrived on the northern border in mid-November, Tijuana residents organized an anti-immigrant march and the mayor implied that members of the caravan were delinquents. The charity paradigm has broken in recent mobilizations. Instead of simply rendering visible the migrant struggle, subsequent caravans have built political power to make the journey safer and help Central Americans apply for asylum in Mexico and the US. The visibility of the caravan has made many Mexicans reexamine their preconceptions about Central American migration and created opportunities to show their solidarity. There is also increasing coördination with US-based organizations that can provide legal aid to people seeking asylum. Organizations like Al Otro Lado, based in Tijuana and Southern California, work to connect asylum seekers in Mexico to resources in the US. Pueblos Sin Fronteras, which is made up of Central Americans who live in Mexico and their Mexican and American allies, is another group that bridges the gap between humanitarian organizations in both countries. As the universal right to seek asylum is under attack from the Trump administration, these networks create collective power to hold authorities accountable for their treatment of migrants and asylum seekers. Martha Balaguera and Alfonso Gonzales wrote in NACLA earlier this year about the members of a 2017 caravan organized by Pueblos Sin Fronteras. Even when applying for asylum at official points of entry, asylum seekers are held for months at a time. Several of the caravan members who were detained after turning themselves in on the border lead a hunger strike while imprisoned at the Adelanto Detention Center in San Bernardino County, California. They protested poor conditions, denial of medical attention, and unreasonable bonds as high as $50,000. The hunger strikers’ experiences of empowerment and solidarity despite such repression defy common representations of refugees’ helplessness at the hands of the state. Indeed, the ability of the Adelanto Nine to see beyond their own dire situation and to reach out to other immigrant communities struggling to defend their rights in the face of abuse suggests an emergent refugee solidarity movement. Organizers have also raised funds to pay bonds, secured pro bono lawyers, sought out housing for people leaving detention and accompany people to the border, even when Customs and Border Patrol repeatedly denies their attempts to seek asylum. Many asylum seekers and other migrants have to face the complex US immigration system alone; transnational organizing is now creating structures so that even people who cannot afford legal representation or a costly coyote have a shot at humanitarian protection, either in the US or Mexico. Instead of an individualized legal process, these groups stress the systematic factors that push people out of the Northern Triangle. As the caravan has made its way north, organizing efforts have sprung up in numerous US cities. Since the caravan reached Tijuana, numerous advocates and volunteers have traveled to provide legal aid and material support. Grassroots organizers in San Diego, who mobilized earlier this year to support the springtime caravan when it arrived in Tijuana, are providing medical care. In Los Angeles, organizations like the Central American Resource Center (CARECEN), the largest Central American immigrant rights group in the country, have spoken out in support, drawing the connection between refugees who fled El Salvador’s Civil War in the 1980s and the caravan members today. The New Sanctuary Coalition, based out of New York, has pledged to provide 40 days and 40 nights of support in Tijuana. Already, the progress of the caravan has inspired other groups to form in Central America. There are now at least six large groups that have entered Mexico since mid-October. Not all have avoided detention and deportations. 600 members of a caravan, mostly Salvadorans, were detained after crossing into Chiapas from Guatemala. The members of another decided to turn themselves in to Mexican authorities to seek asylum. Excluding those who were part of the caravans, Mexico removed over 9,000 Central Americans from the country, just between October 19 and November 25. Yet the caravans have forced Mexican authorities to negotiate and have inspired Mexicans to act in solidarity on an unprecedented scale. I briefly visited Tijuana in the first days of the caravan’s arrival. The border city is no stranger to the arrival of large groups of migrants, asylum seekers and deportees. Two years ago, thousands of Haitians arrived in the city, hoping to enter the US, until Barack Obama abruptly ended their Temporary Protected Status. As far back as 2016, Customs and Border Patrol has limited the number of people who can enter the US to seek asylum on any given day. Hundreds and sometimes thousands of people have become stranded in Tijuana awaiting their turn. Congolese, Haitians, Indians, Salvadorans, Mexicans and Ugandans can be found waiting at the El Chaparral crossing each day. Into this mix arrived upwards of 5,000 Central Americans. While the caravan allowed them to reach the border, their next steps are unclear. The United States is within sight of the temporary shelter set up by the city government. The wait to apply for asylum will easily stretch into weeks, if not months. The temptation to cross with a coyote is real for those who have family who might pay for it. On Sunday, November 25, a segment of the caravan approached US soil and an even smaller number crossed in defiance of the Border Patrol agents staring them down. They were greeted with tear gas. Some members of the caravan have started paperwork to seek asylum in Mexico or apply for temporary residency. Others have decided to return to their home countries. Yet for the thousands who remain in Tijuana with the intention to enter the US, they have defied the efforts of the US and Mexican states to detain their transit. And unlike those who must pass furtively through Mexico’s dangerous territory, they are now connected to a widening network of people and organizations that believe in the right to free movement. Organizations and collectives in Central America, Mexico and the United States that were once highly-fragmented are now creating networks to support asylum seekers as they pass through multiple national borders. The forces driving people to leave Central America remain, and the Trump administration is gradually chipping away at the legal foundations of asylum. 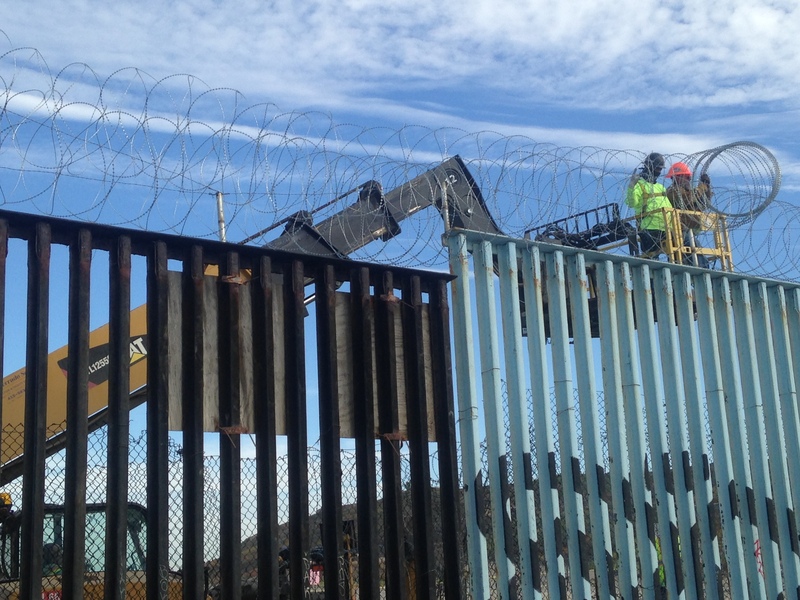 In the face of these structural barriers, solidarity networks in Central and North America are laying the groundwork for a safer path through hostile territory. 1. ↑ A note on language: Throughout this text I refer to “migrants” and alternatively “asylum seekers.” While there are diverse opinions on how to refer to the people who make up the caravan, I use the term migrants because I consider it the most inclusive. Many people who make up the group plan to apply for asylum and fit the categories that international law lays out for asylum. Refugees is another commonly used term, but I have not used it in this text to avoid confusion with the legal category of refugees, who are people resettled from one country to another. This is opposed to asylees and asylum seekers, who are apply for legal status once they reach the country where they are seeking protection. While the term migrant is often associated with people seeking work, it can encompass a wide diversity of reasons that people move from one country to another. I do not consider the right to free movement to be limited to asylum seekers, especially as the Trump administration narrows the categories of people who can seek asylum. For this reason I refer to migrants, who for whatever reason they decide to migrate, should not be criminalized in the countries they pass through, or in their destination.